“The price to Singapore of the PAP’s extraordinarily successful half-century of governance is that the system is now particularly vulnerable to the internal self-renewal of the PAP itself.” – Ho Kwon Ping. International journalists, students, officials, bankers and representatives from established institutions gathered at the National Museum Gallery Theatre yesterday afternoon. They were there for the inaugural Asia Journalism Fellowship (AJF) seminar organized by the Temasek Foundation, Nanyang Technological University (NTU). The session was chaired by Cherian George, a researcher at the Wee Kim Wee School of Communication and Information,NTU. The seminar was titled, “Singapore Beyond Lee Kuan Yew: Institutionalising The Singapore Way”. The event brought together two distinguished guest speakers, namely Kishore Mahbubani, Dean and Professor of the Lee Kuan Yew School of Public Policy, National University of Singapore, and Ho Kwon Ping, Executive Chairman, Banyan Tree Holdings; Chairman, Singapore Management University; Chairman, MediaCorp Pte Ltd.
Mr Mahbubani feels that the question boils down to MM Lee being an “extraordinary leader”, who is admired as a nation builder, an international statesman, and an effective and persuasive leader. Second, what has Singapore done to ensure that MM Lee’s legacy will be protected? Mr Mahbubani listed seven measures undertaken, namely an “exceptional” education system, national service, strong public institutions, a political party who had “learnt the art of winning elections”, ethnic harmony, meritocracy, and stamping out corruption. However, when it came to the question of a Singapore after MM Lee, his take was that no one can be sure what this will be. He speculated three scenarios, one: a seamless transition, second: a significant reversal of the legacy left by MM Lee, and third: PAP continues to rule Singapore, but with a strong opposition force. Mahbubani emphasized that Singapore must be able to conceive the notion of failure, so as to prevent the country degenerating. This was something which former Deputy Prime Minister, Dr Goh Keng Swee, had told him, after the PAP’s monopoly of Parliament was broken in 1981. “As (Dr Goh) has wisely told us, failure happens when we fail to consider the possibility of failure,” said Mr Mahbubani. Mr Ho Kwon Ping felt that MM Lee had already passed the first test all great leaders faced, which is to personally engineer the transition to the next generation of leaders. However, whether MM Lee’s legacy would last beyond several generations, to become “enshrined in lasting, sustainable institutions”, is still unknown, Mr Ho said. 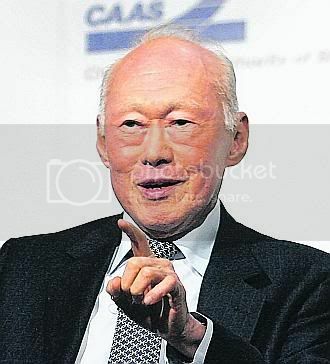 He is, however, confident that Singapore will see a new generation of leaders coming forth in the self-renewal process. But Mr Ho raised doubts over whether the PAP will continue to advance its current one-party dominance by producing its future leaders in which Singaporeans may or may not support in the future. His other concern is whether tomorrow’s generation can weather a change in the political climate which may see more opposition entering the scene. Mr Ho expressed uncertainty over the one-party dominance in the post Lee Kuan Yew era, but said that should it succeed, “they will have created a new model of political governance which will genuinely challenge the fundamental assumptions of Western liberal democracy with its requisite two-party model.” He remains confident that the future generation will “rise to the occasion” when the time calls as their “sense of belonging is strong”. When TOC asked him on his views on the impact of the brain drain in Singapore, Mr Ho said he is not too worried about this, as all Singapore youths want to see the world, but they would return eventually. The government realizes that it cannot control the new media, and it is good that the government is engaging in discussions at the grassroots level to find out more about it, he told TOC. Addressing the government liberalizing its hold on the mainstream media, Mr Ho felt that the government has and is adopting a “pragmatic” approach to satisfy the younger generation’s thirst for democracy, but also being cautious not to upset the heartland, nor “endangering” social stability. 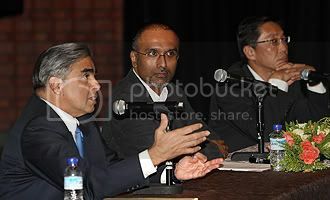 Picture of speakers from Straits Times. Read also: “Yes we can (survive)” by The Straits Times. And: Possible Singapores, beyond LKY by TODAY.